The Active Mobility Advisory Panel (AMAP) has been instrumental in introducing cycling and PMD as a viable mode of transport for the public. 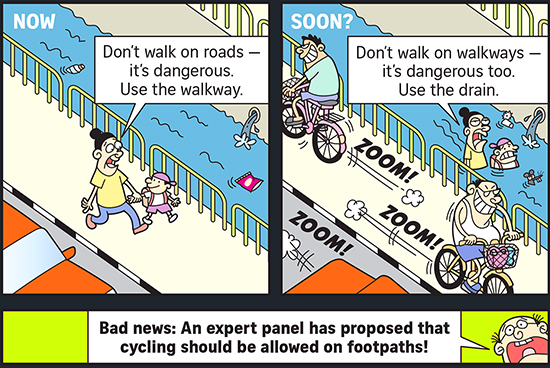 For example, allowing the bicycle to be used on walkways helps many slow cyclists to avoid the risk from cars, which is possible after AMAP’s first recommendation in 2016. For that, I’m truly grateful and proud of being part of it. However, in the midst of pushing for Active Mobility, I, as part of the AMAP members, had underestimated the stress and risks imposed on the pedestrians walking on the pavement. For pedestrian’s safety, it is stated in the Code of Conduct (COC) that bicycle and PMD riders should slow down when they approach the pedestrian. However, some riders ignore the COC because it is just an advisory (optional) and they tend to focus only on the (mandatory) law (15 km/h) and Regulation (20kg/25km/700mm). The law is often a clear reference when a layman judge what is (morally) right or wrong. Some riders take it as their entitled “right” to go at “legal speed limit” and demand the pedestrians to give way as they ring the bell. In case of an accident, these riders blame the pedestrian for unexpected movement, leaving them “no time to react”. However, they never admit the risk was created by themselves because they did not slow down when approaching the pedestrians. I feel we need to protect the pedestrian by law. On reflection, it was not logical to legally allow a new group of fast device riders on the pavement, without demanding the riders to control their device in order not to harm the public. I was disappointed regarding the recent AMAP recommendations for walkways, which only suggested to lower the speed limit, but didn’t take the opportunity to address the issue of the legal requirement for responsible riding on the walkway. Having said that, I must admit what AMAP in Singapore has done is very pioneering and groundbreaking. As far as I know, no another developed country has made it legal for adults to ride on the walkway, riders really need to treat this as a special privileged and to give priority to pedestrians who are more vulnerable. It is understandable that such a radical measure which has never been tried before may take some time to get right. This entry was posted in AMAP, News and tagged AMAP 2016, AMAP 2108, pavement, Pedestrian safety on 2018-09-24 by Francis.